FleetLink Vision and FleetLink Vision+ are on-board computing (OBC) solutions designed for tough environments and more discerning requirements. With FleetLink Vision™ and FleetLink Vision+, solid waste collection organizations have 360-degree visibility of their fleets and the progress of their operations in real-time. 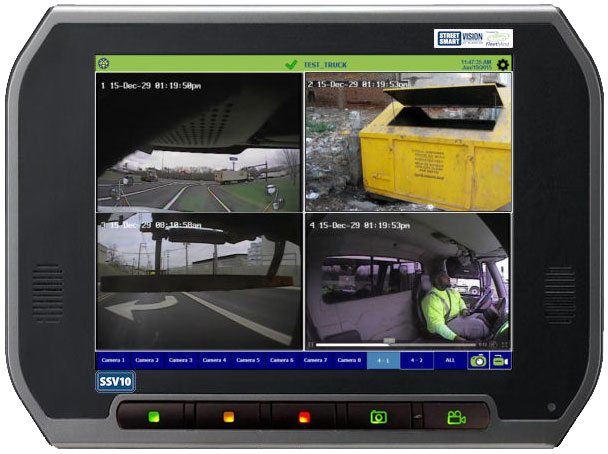 When combined with the FleetLink™ suite of applications, FleetLink Vision provides a unified platform for evidence-based tracking of all events in and around each vehicle, generating the data that solid waste haulers need for service verification, customer service, safety coaching, and accident investigation. The FleetLink suite of applications also offers interfaces to 3rd party dispatch, billing, route optimization, maintenance, and other applications.